Straight from a long lunch, I raised my umbrella and headed for the pedestrian bridge. 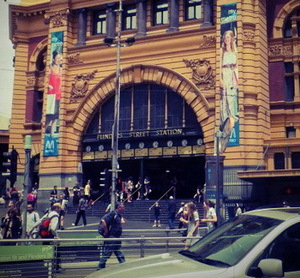 Crossing the river, I turned onto the station path; Melbourne cold and soaked after six days rain. I recall the soulful sounds of an upright two-string Vietnamese fiddle commingling with the distant strains of bagpipes that echo from under the bluestone bridge. There’s the flash of a tram – all green and gold – the city-bound clatter and the clang of a bell. Looking at my watch, I’ve shaken the umbrella and turned to drop down the steps, I scan my ticket after dodging smokers engrossed in that final cigarette; the bang of the rotating barricade rebounding on tunnel walls, me passing busy office workers pushing in the opposite direction. At the foot of my platform up-ramp something stirred; a dark shadowed mound, commuters bypassing in the gloom. Moving closer, I stopped short of my ramp. A hooded, stooped vision sat – a man I guessed – jacket back against the subway wall, surrounded by bulging plastic bags; blanket-wrapped knees pulled up under a stubble chin. And an ancient upright shopping trolley; tartan canvas ripped, miss-matched wheels. I took the extra steps to drop some coins by the cup, before stepping back and rushing on and up the ramp. At the top I paused. Peering up at the board, I’ve missed my train, but really wasn’t bothered; preoccupied with thoughts of the man in the tunnel below. I’ve asked the platform attendant. “Yeah mate, I know who you mean.” He shook his head. “Don’t see him much though; reckon he’s about 18. We call him Brian.” I must have looked surprised. “Yeah, we give them all names. I see new faces every day `round here. You know… I reckon there’s thousands of them. They could fill a football ground with the homeless here!” His eyes narrowed in thought. “How can that bloody-well be?” He again paused, scratched his chin and twisted the corner of his mouth. “I’ve no idea where Brian goes at night. Someone sees him across the road at St. Pauls when it’s really cold; after some charity soup I suppose.” He pointed up the platform. “But I reckon he sleeps in the rail yards. He don’t like the refuges; says there’s no privacy, so he moves around a bit.” I stared back down the bustling ramp to the tunnel; at the commuters surging up and down. Today it’s almost twelve months since standing on that same covered platform with Brian sheltering below, me having again spent time in the great cities of Europe and the cultural smorgasbord of New York. I’m home, lucky to reside the a city of my choosing, and immersing myself in the largest cultural event in Australia – the Melbourne International Comedy Festival 2013 – but there’s also the eclectic live music that keeps me here; the architecture, film and theatre. There’s sport if you’re that way inclined. And yes, there are the people of course; dressed in ubiquitous tones of Melbourne black. I stare out across the rail yards and into the rusted jungle of tracks and posts. I’m stuck with the thought of Brian, still sleeping rough, lugging his meagre belongings and heading into another Melbourne winter. I zip up my Gore-Tex jacket and lift my eyes from the rail yard maze, to the distant tiers and light towers of the Melbourne Football Ground; the 1853 `MCG’ being the home of Australian Rules football and considered an iconic world sports venue with capacity for 100,000 fans. It seems appropriate that the Melbourne City Mission hopes for willing souls to pay money to rough-it; for the privilege of bedding down under the stars in the hallowed concourse, and to help end youth homelessness. The ticket includes a beanie, pillow and cardboard box to sleep on. There are bread rolls, soup and a meat pie for dinner. In the morning, breakfast is a muffin, with tea or coffee. I’m sure Brian would approve – if he’s still with us – especially if offered a quiet seat somewhere off to the side, along with a muffin. I wonder how the rest of the less-lucky world is doing. For some reason, I thought your country didn’t have as serious a homeless problem as the US, especially since you guys have national healthcare. What’s driving the homelessness, especially amongst younger folks? Very compelling piece. Thanks for dropping by Kris. What strikes me most about this story isn’t in the story itself, nor writing, but the open hearfelt reaction and hinest discussion from the readership and genuine concern for all within community. My personal experience in U.S. society is its better to avoid and ignore, or dissasociate oneself, instead best to insulate from, thus always cast ourselves in the best possible light in our one way upwards Only expressway hierarchical society. Heck even our online social networks are one way only, offering only the “+thumbupLike” option when you contemplate whether the comment avoidance button click, will put one in a better light to those we perceive ahead on the expressway to where everyone thinks they’re in a rush and destuned to arrive at, to just be. Thanks so much for dropping by Ted. Just reading through these comments, I see what you mean. This post really hit home for me. I see so many homeless here in NYC. There are always people I pass by begging for coins or food. They all have some past or story about how they got there. One can only hope they find some sort of salvation. I do love your city, second only to my home. It seems we (the world) do have a problem & to be honest I’m not sure where it’s leading. Once upon a time I tried to really imagine the plight of some homeless people, and stopped myself moments before tears. I tend to drop a few dollar in the cup of a homeless person at lest a few times a week. If I had more I would do more. Yeah, I know what you mean PB. I actually read this piece more than a week ago but didn’t have time then to reply. However, I felt that I should comment on this story, which captures so well the kind of hopelessness that I associate with homelessness. The power of the story comes from your decision to focus on just one person, because large, impersonal numbers are meaningless in this context. And genuine homelessness is above all a personal tragedy. Yes, that feeling of hopelessness must indeed be soul destroying. A touching post. Great thought infused in animated description. I agree, that we all have right to a standard living adequate for the health and well being. I suppose there are some thieves and “lazy” ones, but overall, I think if they had chances, they would work. Thanks for dropping by Yun Yi. So glad you enjoyed the piece. Very moving post, Ian, and written with such heart. I can see the “hooded, stooped vision” you describe in such meticulous detail because I’ve seen Brian before…in subways, transit stations, on the streets…in New York, San Francisco, Washington, DC. Heartbreaking. That you took those extra steps to drop coins by his cup and were then preoccupied thinking about him speaks volumes about your compassion. The stark contrast between the image of the homeless like the young Brian, sitting despondent in rail stations, and the oblivious city-goers rushing past them is indeed the “darker side of the urban dream.” Whenever I pass homeless, I always give what I can. When I lived in San Francisco, I would pass out sandwiches and socks to homeless along Market St. The Melbourne City Mission project to help end youth homelessness is commendable and were I there, I’d have paid the $60 for that privilege. Thank you for this thoughtful post. I find it disappointing if some pass with no feelings of compassion. What a moving piece Ian. I love the evocative atmosphere of your writing. Do you remember the Men at Work song “Touching the Untouchables”? This post brings that to mind. That is a moving piece for sure. This is something that I have been thinking about especially when I nestled up in my warm home whilst outside is pouring with rain and freezing cold, at times with snow. More and more people are losing their homes through this economic downturn and the government has been saying that the majority of working class people are 1 pay cheque away from losing their homes. Not good at all. Life has a way of turning things upside down in an instant so wherever I am today, does not guarantee that I’ll be in that same place or position tomorrow. I could be Brian this time next year. There are many Brian’s out there and although I try to help when I can by giving them food, I also have to weigh up in my mind if their plight is genuine or not. & yes, I guess many of us do make that decision re: legitimacy. Although I wonder if there are some that don’t care either way. & yes, one human being – so much indifference. I found this piece heart-wrenching and truthful. The “Brian’s” of the world are everywhere. The same people on the corners…waiting for a little help. The divide between the haves and have-nots growing every day. It shames me to think that we can’t do more. I must admit I am fascinated with the concept of “experiencing homelessness.” There is a part of me that doesn’t understand why someone has to sleep outside in a safe, shared environment with others who are paying for the same experience so they can “feel” how devastating being homeless can be. That’s a little like thinking you understand the concept of drowning by holding your breath underwater. Regardless, the money is going to a great cause…and I very much liked your post. Good job, Ian. Yes Annie, I know what you mean about having to do something before we are capable of `feeling’ the despair of homelessness. The notion may be a little uncomfortable for some of us; maybe even a little `yuppy’?. But still, it is worthwhile, being for a great cause, like you say. I do not know how worse it can get on any part of the planet -India has millions who retire to the night with ‘ash and dung in their stomach’ – but it deflates the high pedestal on which humanity has self-appointed itself. You don’t have to be an angel to be perturbed. As always, I am reminded of Phil Collin’s ‘Another Day in Paradise’. Thank you for sharing. India is never far from my thoughts when pondering this subject US. My experiences in your country have changed me – I hope for the better. The imagery is just right: sparing and meaningful. You blend your story with your encounter with Brian so well, that emotions are felt for both. I like the way you broaden the scope of the story in the end “Everyone has the right to a standard of living adequate for the health and well-being of themselves and their family.” A profound ending, one that makes you think of rainy days, depression, and people in need of help. Brilliant job pacing the story by the way. Well done! I cannot help but wonder what this son’s story is, a youth younger than my children. The contrasts you describe are quite striking, Ian… the stadium where one can pay $60 to experience homelessness, sleeping outdoors in public… the cultural amenities of Melbourne and the hustle and bustle of so many people… against the striking image of this young man who has nowhere to go and nothing to do, just surviving. I wish we could know what his story is! Thanks for dropping by Susan. Yes, there is always a story I’m sure. Family issues? I saw this guy only once, & haven’t forgotten.